However I ordered 110, so will trade outside the club as well. 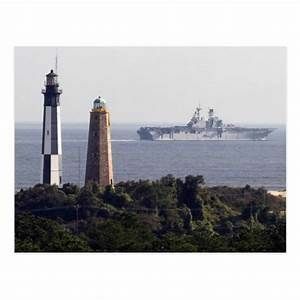 I was a volunteer for the Cape Henry lighthouse in 1977 & 1978, so it has a special place in my heart and was the starting point for a lifetime interest in lighthouses. 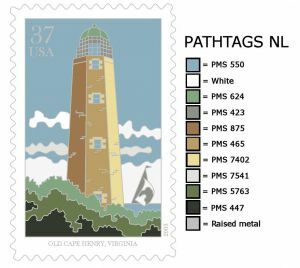 I'm a current member of the US Lighthouse Society and still try to visit as many lighthouses as I can. Thanks to Pathtags NL for another great translation to the Pathtag format. First lighthouse authorized by Congress, its lantern was lit for the first time in 1792. John McComb Jr was the designer who plotted a 90 foot tall octagonal tower made of brick. Located at Fort Story, Virginia. Lamps and Lens were destroyed during the Civil War. In 1857 a 2nd order Fersnel lens was installed. The wood staircase was replaced by a cast iron staircase in 1864. 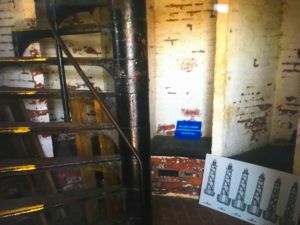 The Cape Henry is the 4th oldest lighthouse still standing in the US. 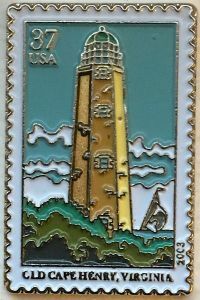 Part of the Southeastern Lighthouse series of postage stamps issued by USPS on 13 June 2003.